Octopus is an interesting creature many want to see. Many octopuses live in the reefs of Maldives but snorkelers may not see them because they are difficult to spot. 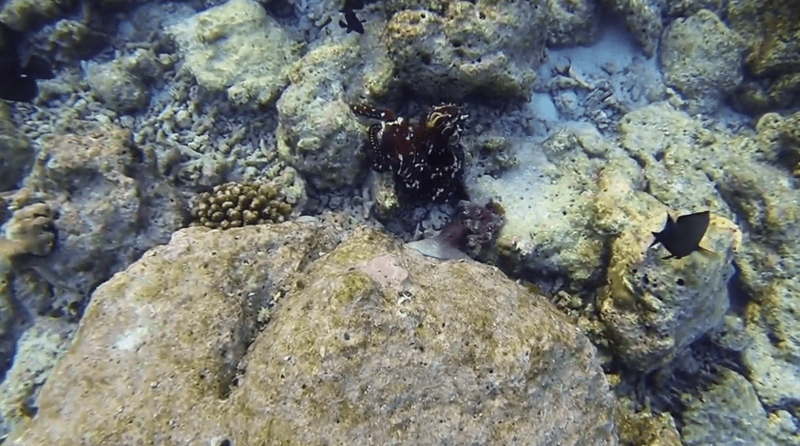 Octopus changes its skin colour to blend in to the environment. That makes spotting octopus difficult to humans and other fish they prey on. My recent snorkeling trip to Kurumba Maldives house reef was amazing. I saw many octopuses, I saw them up close, like 3 metres from them and even closer. If you go too close it makes them afraid of you, so that is not recommended. At Kurumba house reef I saw at least 4 octopuses. In one point I saw two of them next to each other. If you want to see octopus the best resort I would recommend is Kurumba. If you do not want to stay in the resort you may take a day trip and it would save a lot of money especially if you are on a budget. But, if you afford Kurumba is a nice 5 star resort that comes with crystal clear lagoon and powder white beach. There are many baby sharks in the lagoon. Don’t be afraid, they do not bite as they have better meals in the sea than you. But, that does not mean you should feed them, do not do that, just leave they in their natural habitat. If you want to see bigger sharks they live in the reef, go the drop off point and you will see big ones. They wont come to you either. Back to octopus story, I found they very playful to watch. They move every few minutes and change the colour and try to catch fish. They are good in camouflaging but after a while I did not see any fish caught. I guess they spend whole day and night on this game. Octopuses look like coral and it is difficult to spot at first, especially you are not used to sea life. Look for movements of objects that look like coral. Sometimes they move very slowly, sometimes you see their tentacles but not always. At Kurumba reef octopuses are not the only thing you see. There are plenty of rare fish and different corals. May be the corals are not as colourful as in some other resorts I have been to but it is not bad either. For coral I would say it is a usual Maldives resort. For octopus sighting I think this is the best in Maldives. See the Maldives map on google, Kurumba has house reef all around the island. This is not unusual in Maldives, but thought to mention it. Usually the larger the reef the better in terms of experience. You can also see stingrays, eagle rays, sharks, turtles etc. Eagle rays are very friendly at times. In other reefs I snorkeled they are not friendly. Stingrays are usually friendly, it is the case at Kurumba reef as well.